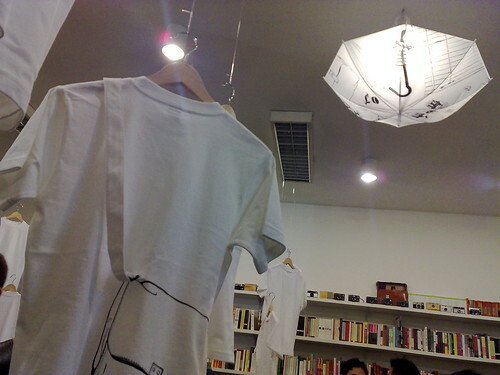 Not that I’m a T-shirt maven, but when I heard that BooksActually was hosting an exhibition of the Japanese T-shirt project Shikisai (co-presented by Crop Design), I decided to pop by to check it out for myself. The exhibition promised “different possibilities of T-shirt design under the restrictions of ‘the black print on a white T-shirt'”. This translated into a display of 10-12 white T-shirts, each one adorned with a pencil-like black sketch with an additional element hand-sewn onto the garment. 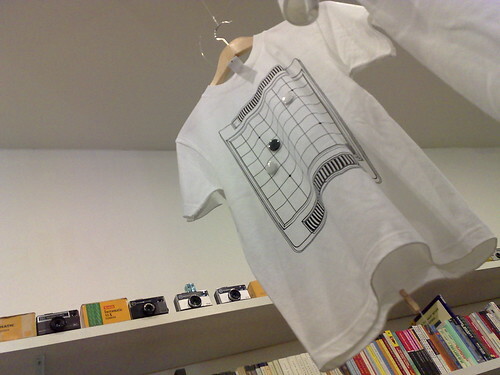 For instance, the very first design in the series was the “meta T-shirt”: a white-T-shirt, carrying a sketch of a T-shirt, with a tiny size tag sewn onto the drawn T-shirt. One of my favourites, though this is maybe the nostalgia speaking, was the Reversi design. I played hours of Reversi/Othello as a child and I like the symmetrical neatness of this design. On the other hand, as my friend Suzie pointed out, they didn’t stitch the actual reversible game pieces onto the T-shirt — these pieces are either all-black or all-white only. All T-shirts on display are on sale, exclusively at BooksActually, and range from $85 to $120 (or thereabouts). From what I saw tonight, the owners’ll even let you pop into the bathroom to try on the T-shirt for size. Check it out before the exhibition closes on 8 September.